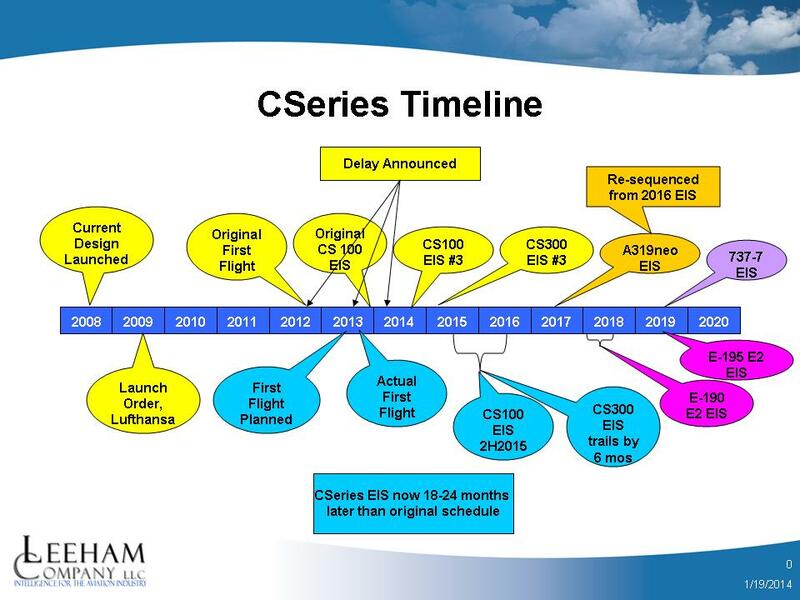 CSeries timeline: Bombardier last week announced a third delay in the CSeries program, this time for as much as a year. This probably should have been expected. BBD originally planned a five year period between program launch and entry-into-service. As we saw with the Boeing 787, launched with a four year timeline, even five years was too ambitious. The EIS period for the 787 turned out to be the standard seven years, almost eight–and even then, the EIS was anything but smooth. Airbus’ launch-to-EIS for the final A350 version is somewhat more than eight years. Even though BBD is a sub-contractor on the 787 program and said it benefited from lessons learned, it’s clear officials were far too ambitious. KC-46A roll-out: Boeing’s first tanker for the USAF based on the 767-200ER will roll out this summer. The Everett Herald has this story. The airplane is a somewhat revised 767-200ER called the 767-2C. In addition to upgrades with the airframe, the Pratt & Whitney PW4000 engines will have upgrades which improve fuel consumption. China’s new airplane: China isn’t just developing the ARJ21, C919 and some military airplanes. It’s also developing the world’s largest amphibian. BBD a subcontractor on 787 ??? Yup. Well down the line, but yup. So is Airbus unit Composites Atlantic. So is Airbus unit Premium Aerotec supplying composite parts to the 787. Funny. When Boeing found out that Airbus had taken over PFW (Pfalz Flugzeug Werk) in Germany, a sub-company lost work with Boeing because of it. PFW in the last half decade got between a rock and a hard place ( the liquidity and resources sapping Dreamliner pipe-dreams^Hworks and the new owner a “Finanz-Heuschrecke”. There seem to be other suppliers around with the same illness spectrum. apropos: who lost out on supplying Boeing? The company doesn’t do manufacturing but rather engineering. They are call GCT and are base in the Sonderflughafen in Oberpfaffenhofen southwest of Munich. They were taken over by PFW around 2008 or 2009 and got picked up along with PFW when Airbus bought them last year. Bombardier used to make rear pressure bulkheads for the 767s. I don’t know if they still do so. Uwe, PFW was taken over by Airbus last year again. PFW ran into problems not only because of the 787 but the A380, the A400 and to a certain degree the A350 as well. The 747-8 might also be a partial source of their woes but do not know for certain. Thanks for the info ( actually both sets ). when we did an instrument package acceptance flight 15 years ago.